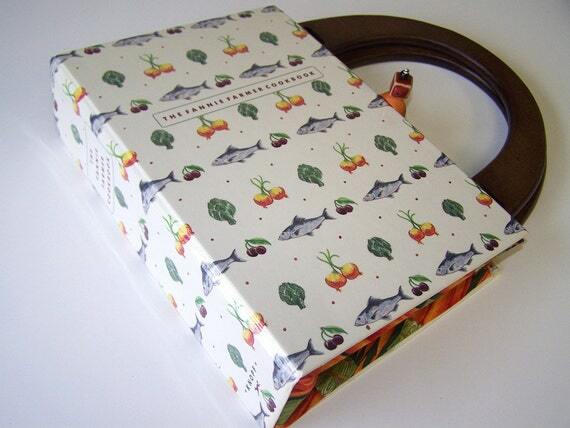 This Book Purse is made using the beautiful cover of â€œThe Fannie Farmer Cookbookâ€. And Iâ€™m so glad I found more of one of these books during my treasure hunts. Because I want to keep one of them for myself! The cover shows a graphic illustrations for fish, plums, avocados and onions! I did a little dance in the store when I found the fun carrot print that I used to line the purse. I know, it doesnâ€™t take much to get me excited. I used a stone bead as a closure and nice wide wooden handles. The Book Purse measures 9 x 6.75â€ and opens to 8.5â€. It has a generous 2.5â€ spine. Plenty of room for a purse to carry to the grocery store... or anywhere! Would make a wonderful gift for someone who loves to cook. I never use new or unread books for my book purses because I respect the original intent of the book. But once the book has been read it need not sit on a shelf collecting dust! This unique Book Purse gives books new life and you something smart and functional!